Marvel© comics and Stan Lee have been in my heart and mind since childhood. Mind you, I’m 55, and the Super Hero hype was as solid as is today. His passing, has left a void as an old family member. Never met, but always loved. Year 1969: The announcement of a NEW Marvel© SpiderMan animated series. The news was all over the neighborhood streets and school yards. I couldn’t wait for the 1st episode. The day came as I ran home for my after-School delight. There was no disappointment dear Marvel fans. My little Black & White 9 inch screen was bringing me excitement no comic book ever did. Of course, I continued enjoying and drawing from Marvel and DC comic books. However, this new Animation of Super Heroes, rather than Disney Mickey Mouse cartoons, was a great addition to my future and others Saturday morning cartoon extravaganza. Many followed Spidey into my heart and drawings. All 4 Marvel prints available now at VapeSling.com for all your V3.0 Fabric Slings selections. All VapeSling® models are “Made in the USA” with premium U.S. made materials. The VapeSling® breakthrough concept was born from e-cig/mod portability problems encountered with hand carry, pockets, pouches, belt clips, and all other available forms of e-cig/Mod portability. VapeSling® uses a unique Patent Pending concept which allows the user to carry, vape, and move. VapeSling® users can vape while their e-cig/mod is attached to their VapeSling®. Whether on the move or relaxing on a couch, a #VapeSlinger can carry their e-cig/mod comfortably, securely, and always ready to vape. No retrieving or re-deposits of your e-cig/Mod into any case, pouch, bag or pockets. No more devices falling to the ground. The VapeSling innovation has withstood the test of time by thousands of #VapeSlingers. Enjoying CARRY.VAPE.MOVE. for 3 years since 2014. All device sizes, weights and shapes (Box, Cylindrical, etc.) will fit securely on your VapeSling® e-cig/Mod Holder. IL – Stop Tobacco AND Vapor 21! 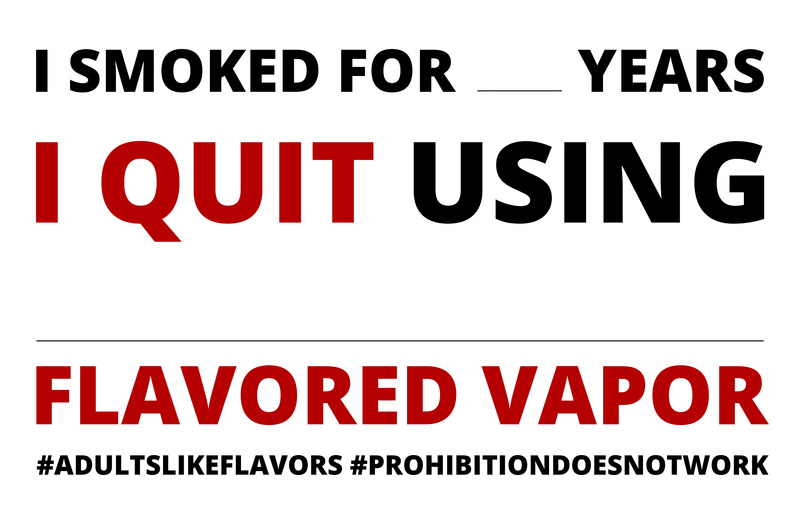 NY – Stop a Flavor Ban before it Starts! Nassau Co., NY – Stop Tobacco AND Vapor 21! IL – Three bills would deny adult access to life-saving vapor products! Ulster Co., NY – Last Chance to Oppose Tobacco (and Vaping) 21! VT – Help stop a tax on vaping! Posted 05.14.18 Thanks to IG’s @hell_wolfie for the alert. Last day May 1st: A Survey just for Users of Vapor Products. This study is performed for research purposes only, with the purpose of publishing the findings in scientific journals, presenting them in conferences and informing FDA regulators. Your replies will be used solely for the stated purpose and for no other study for which you have not previously been informed and give your consent. MN – Stop an outrageous tax hike on vaping! CASAA notice on FDA (ANPRM) Vapor Flavors. Click here to learn more plus take action. Akron, OH – Stop Tobacco and Vapor 21! FL – Stop an Anti-Vaping amendment in the state’s constitution! A Survey just for Users of Vapor Products. This study is performed for research purposes only, with the purpose of publishing the findings in scientific journals, presenting them in conferences and informing regulators. Your replies will be used solely for the stated purpose and for no other study for which you have not previously been informed and give your consent. NY – Keep Vapor Taxes OUT of the State’s Budget! Posted 03.21.18 –>Thanks to @jenbergercoleman & @a.billion.vapers for the Heads Up! Extremely Important CTA–>Flavor Ban: Submit a Comment to the Federal Register on E-liquid Flavors. A Rule on flavors will take place after our comments are heard. Our opinion matters and must be heard. Please submit your comment including your need for flavors to continue smoke free. Be polite in your submission. This is for real and will count tremendously. Mention every flavor you like no matter how juvenile the name. Such as Cotton Candy, Fruity Cereal or pop tart flavors. We are adults, however, many of us still enjoy flavors from our childhood. Let them know today! The Count for today at the FDA. See the comments already in by the Vape Community, family and friends. RI – Stop an outrageous 80% tax on vapor! The U.S. Food and Drug Administration today announced a series of critical and historic enforcement actions related to the sale and marketing of e-cigarettes to kids. In the largest coordinated enforcement effort in the FDA’s history, the agency issued more than 1,300 warning letters and civil money penalty complaints (fines) to retailers who illegally sold JUUL and other e-cigarette products to minors during a nationwide, undercover blitz of brick-and-mortar and online stores this summer. As a result of these violations of the law – and other indications that e-cigarette use among youth has hit epidemic proportions – FDA Commissioner Scott Gottlieb, M.D., signaled that the agency intends to take new and significant steps to address this challenge in a speech at the agency’s headquarters. 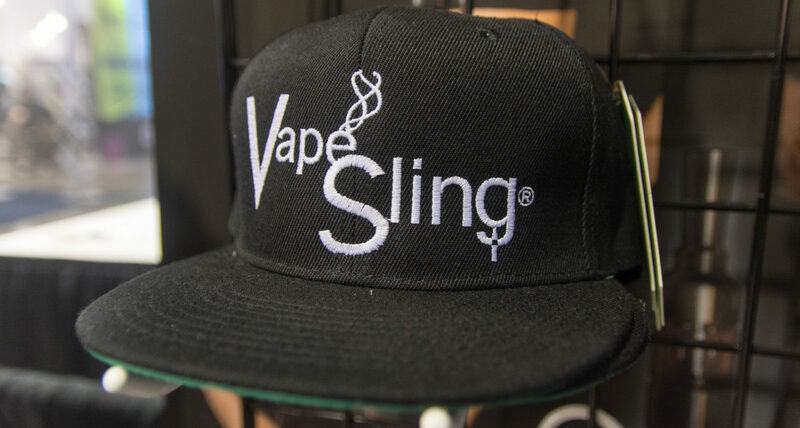 VapeSling® Custom Options are available for all slings, with the exception of Send & Sling™, which is exclusive to V3 VapeSlings. Custom Cradle: Matchy, Matchy or Add more color to your sling. Choose any single color, or dual color scheme for the VS logo and Boundary embroidery. Send & Sling™ (V3 only): Have a favorite print in mind? If we don’t stock it (see color choices on each V3 sling) you can send it. Send any print you like for your V3 sling. Soon to come: Monogram embroidery. Brand your Sling with your initials. Available now: Bundle offer includes a 510toEgo Extender plus a Beauty Ring-Thread Cover. The 510toEgo Extender will guarantee any 510 or Ego atty to connect when using any VapeSling. A Beauty Ring-Thread Cover is a polished metal piece that fits over the threads on your 510 extender. Provides an elegant, cosmetic appeal to the your Vape Setup. Beauty Rings/Thread Covers: Small Size on top accommodates e-pens, mini-tanks, small atty, etc. Large size on bottom accommodates Regular to large tanks and Atty. We hope you enjoyed your V3 selections and featured prints so far. As always, please let us know. For comments on this new feature or anything you want to say, please tell us about it in the comments section or the Contact Us page. Reminder: You always have the option to choose your own fabric print by adding the complimentary product: Send&Sling. Lastly, our USPTO patent should grant in 2018. Filed in 2014, our USPTO NPA is finally on the examiners desk.